Spider-Man introduces his fellow Marvel super heroes to a whole new generation! And he begins by swinging into Wakanda - home of the Black Panther! When Doctor Octopus goes on the hunt for the incredible metal Vibranium, it'll take the combined might of the web-slinger and the warrior king to keep the prize out of Ock's many arms! Then, Spidey joins Doctor Strange on a magical mission to save the world from Hela, goddess of the Asgardian underworld! Plus: Kate "Hawkeye" Bishop! The astonishing Ant-Man! Ms. Marvel! Lockjaw! And the Inhuman called Inferno! Marvel's greatest characters take the spotlight in tales you can share with anyone - from your kids to your friends! 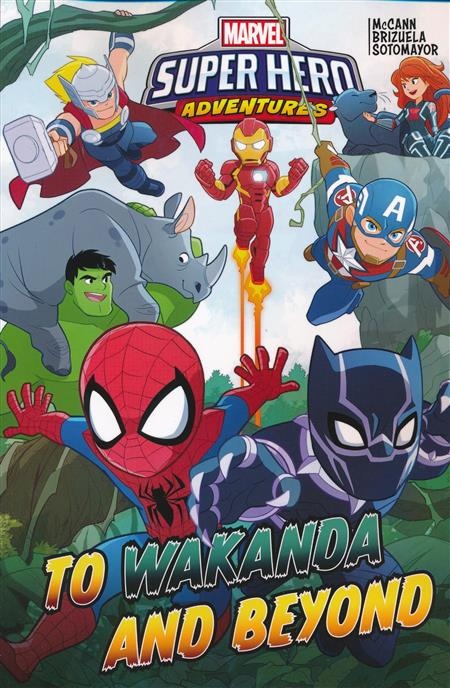 Collecting MARVEL SUPER HERO ADVENTURES: SPIDER-MAN AND THE STOLEN VIBRANIUM; THE SPIDER-DOCTOR; WEBS AND ARROWS AND ANTS, OH MY! ; MS. MARVEL AND THE TELEPORTING DOG; and INFERNO.